You be the deciding factor on The Voice Nigeria! 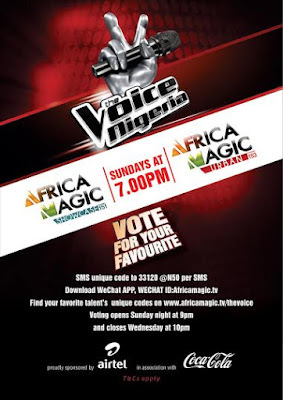 HomeNEWSYou be the deciding factor on The Voice Nigeria! Anticipation keeps mounting as some of The Voice Nigeria talents are up for eviction, but once again, You have a say in who stays in the competition! To vote, SMS the talent's unique code to 33120 (SMS costs 50Naira only). Alternatively you can vote via WeChat, just follow these 3 EASY steps below: i) Download and install the WeChat app on your android devices from your app store (Apple app store, Google play store and Blackberry World) ii) Follow the AfricaMagic official WeChat ID - AFRICAMAGICTV iii) Select the Vote option and vote! Each WeChat user is allowed to vote 100 times! and this is ABSOLUTELY FREE! Get voting now to save your favourite talents. For more information, log on to the website atwww.africamagic.dstv.com. The Voice Nigeria is proudly brought to you by Africa Magic and proudly sponsored by Airtel in association with Coca Cola.